Shiatsu which literally means ‘finger pressure’ is a Japanese healing art based in the same oriental tradition as acupuncture. Instead of needles the practitioner uses the power of touch and pressure to stimulate meridians or energy points in the body. Shiatsu induces deep relaxation and a feeling of wellbeing energising the body. CranioSacral is a gentle hands on method of evaluating and enhancing the function of a physiological body system called the CranioSacral system, comprised of the membranes and cerebrospinal fluid that surround and protect the brain and spinal cord, plus the bones of the head spine and sacrum. Improving the overall health and functioning of the CranioSacral system has a systemic healing effect on the whole body. Holistic practitioners have always seen marked improvements when individuals make appropriate dietary changes. Food is recognised in the west as an important healing source. What foods are best for overcoming personal imbalances and for maximising vitality in each individual. Yoga is the world’s oldest system of personal development for body, mind and spirit. The word yoga means ‘joining’ and its principle purpose is to unite the individual self. Yoga postures exercise every part of the body, stretching and toning the muscles and joints, the spine and the entire skeletal system. Worlds first certified organic skincare, haircare, oralcare and cosmetic products. Our skin is the largest eliminatory organ in the body. Toxins are eliminated through the skin via perspiration and absorbed through the skin into the body's systemic circulation. Learn how to choose certified organic skin care and personal care products to suit you. Payment accepted by cash, cheque or efpos. Rebates available from some health funds. Appointments available Monday to Thursday 9am to 3pm. Geraldine began her training in 1988 at The Zen Shiatsu Centre, Sydney as a Shiatsu Practitioner, Macrobiotic and Wholefood Counsellor and Yoga Teacher. She qualified in 1989 with a Diploma in Zen Shiatsu and Yoga Therapy. Her interest in balancing and healing the body on all levels has led to three successful practices in Sydney, Dublin and now Hobart. 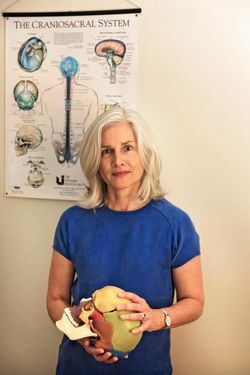 Geraldine continued her postgraduate education by attending The Upledger Institutes satellites in the UK, Ireland, USA and Australia, learning about the gentle but powerful touch of CranioSacral Therapy ( CST ). 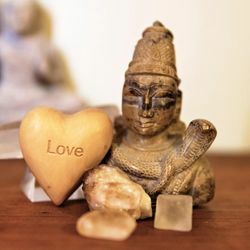 She is a Diplomate Certified CranioSacral Therapist and is a teaching assistant for The Upledger Institute since 1999. She now runs The Upledger CST study group in Hobart. She has also run The Introduction to CranioSacral Therapy one day course in Hobart and Melbourne. She is passionate about supporting a healthy, holistic approach to life and assisting her clients to reach their full potential. Geraldine now lives and practices in Hobart Tasmania. Shiatsu developed from traditional oriental massage and in common with acupuncture and other oriental therapies works on the body’s energetic system. Energy, known as Ki in Japanese flows through the body, like a system of rivers and canals. Lifestyle choices, stress, ill health and injury upset the smooth flow of Ki causing blockages or dams in some areas, weakness or stagnation in others. Shiatsu uses the network of rivers known as meridians or energy pathways to unblock the dams and revitalise the empty areas. A shiatsu treatment takes place on a futon or massage table. The client is fully clothed in loose comfortable clothing. A shiatsu treatment uses physical pressure and meridian unwinding to unblock and clear stagnation that may be leading to physical, psychological or emotional disturbance in the body. Shiatsu helps keep the body healthy, flexible and in balance as well as monitoring the energetic changes that may be a sign of sickness developing. Geraldine combines the arts of East and West integrating the application of CranioSacral Therapy and Shiatsu in her holistic treatments with positive results. She may also suggest dietary, supplements, exercise and lifestyle changes where appropriate to sustain the effect of the treatment between sessions. Chronic and Acute Neck and Back Pain. CranioSacral therapy is subtle in approach yet powerful in its effectiveness. This treatment is beneficial for people of all ages. Its roots are based in Osteopathy. The CranioSacral system is one of the body’s physiological systems, consisting of the membranes which surround the central nervous system (the brain and spinal cord) The bones of the cranium and sacrum which are connected to these membranes, the fascia which radiates out from the membrane to all parts of the body. All of these structures are set in a gentle rhythmic motion by the cerebrospinal fluid produced at the centre of the brain. The free flow of fluid to every tissue is essential to good health. As the client lies on a massage table fully clothed the practitioner works with the client to assist the body's self-correcting mechanisms. Using a light pressure the practitioner evaluates the body's cranioSacral system. This system plays the vital role of maintaining the environment in which the central nervous system functions. 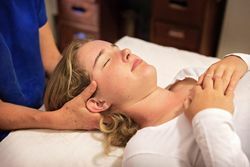 The practitioner essentially helps the body release restrictions which it has been unable to overcome on its own by assisting the natural movement of the fluid within the cranioSacral system. The function of CranioSacral Therapy is to identify the source of any restriction in the body and to unwind the tissues thereby restoring proper function and wellbeing to the effected area. Shiatsu and CranioSacral therapy are a great way of getting in touch with the positive and natural changes that occur in pregnancy. It gives an increased awareness of the body, physically and emotionally offering a great opportunity to tune into the unborn baby. The stress and tension of modern life in pregnancy can be greatly alleviated with treatment. Morning sickness and backache can be addressed in a safe and nurturing way. Because of its gentle approach CranioSacral therapy is safe and effective in supporting the development of babies and children. The most common issues are colic, sleep disturbance and excessive crying often due to the effects of birth trauma. Children benefit with any health issue especially ear, nose and throat problems, Speech and learning difficulties. Balance in diet is unique for each individual. A major complaint of people is conflicting views about diet and nutrition. Geraldine helps to guide each individual to choose healthy wholesome food choices that are best for his or her particular constitution and condition. With knowledge of how foods act in the body each season the client can feel empowered about their choices. Geraldine studied Oki Yoga as part of her Shiatsu training in1989. Oki Yoga is a system of meridian exercises designed to stretch and revitalise the body’s energy pathways. Our body is able to maintain a healthy equilibrium of physiological activity by each meridian performing its proper role or function. For this to happen, Ki or lifeforce must constantly circulate through each one of the meridians. Exercising the meridians facilitates the flow of Ki through out the body. She continued her yoga training in Europe and India with Hatha Yoga. This system of Asanas, a term which means steady pose, is based in a 3000-year-old discipline. Asanas work on the glands and organs as well as the muscles. They effect the deeper and more subtle parts of the body. The internal organs receive massage and stimulation through the various movements of the asanas and are toned into more efficient functioning. The nervous system is rejuvenated, helping to balance the emotions and improve the mental outlook on life. Geraldine has run the yoga programme at The Hobart Aquatic Centre, Personal Best Fitness in North Hobart and now she runs weekly classes in South Hobart at St Francis Xaviers hall. She is teaching yoga at the The Nourish You Women's Retreat in Bali July 2018. Geraldine is passionate about supporting her clients with healthy diet and lifestyle choices whilst supporting the enviroment. She is an Independent Representative for ONEgroup the worlds first certified organic skin care and personal care range. How do we really know what we are buying is really 'Natural' and 'Organic' ? Fortunately, there is a simple way to differentiate between hype and truth in cosmetics and skin care. By reading the ingredient list on the label and choosing a certified organic product which is governed by a number of internationally recognised bodies. In Australia, Australian Certified Organic ( ACO ) is the largest. Please contact her for any information you may require regarding your choices. Diploma in Zen Shiatsu, Nutritional Counselling, Yoga. Diplomate certified with The Upledger Institute.